Whether you are living in Ireland and planning a short break or are visiting Ireland from abroad, it is always enjoyable to mull over some tourism books and in particular a well written guide book for your destination. Having spent the last few days doing just that we are pleased to share our review of ‘Exploring Ireland’s Wild Atlantic Way – A Travel Guide to the West Coast of Ireland’ by David Flanagan and Richard Creagh; Published by Three Rock Books. The authors, an Irish duo, are a writer and a photographer both with great knowledge and clearly a love of the west coast of Ireland. They are seasoned mountaineers, specializing in rock climbing but don’t let that put you off, this book details activities and experiences for all ages and interests. Find out below how you might win a copy of this guide book for yourself! The 224 page book is organised, happily, in the same way as our website with sections for each county with Sligo and Leitrim sharing a chapter. There is useful general information about weather (by season), activities, driving and navigating generally. Each chapter details the route as one may travel from town to town, taking in the sights and beaches not to be missed. Each location mentioned has the longitude and latitude coordinates shown which can be entered into Google Maps or Bing Maps prior to setting out in case your phone signal lets you down. Throughout the book there are useful maps (to scale) accompanied by really beautiful photography from the iconic Discovery Points in each area to the wildflowers, wildlife and outdoor activities on offer. Many useful website links for accommodation, activities and transport will also aid the travel planner. Far from encouraging, or tempting, you to take on too much, the authors suggest to choose an area and linger awhile rather than rush from one destination to the next. Enjoy the experience of being somewhere really different from your work-a-day life. We agree! How to win a copy of this lovely guide book for free! This survey is now closed. Congratulations to Marie Greig from Carlow who won the copy of Exploring Ireland’s Wild Atlantic Way! We would love to know more about you, how you travel, what you look for in a vacation, what devices and social media you prefer and most importantly what experiences you seek in an Irish vacation. Please complete our short online survey and you will be in with a chance to win a copy of the book for Free! 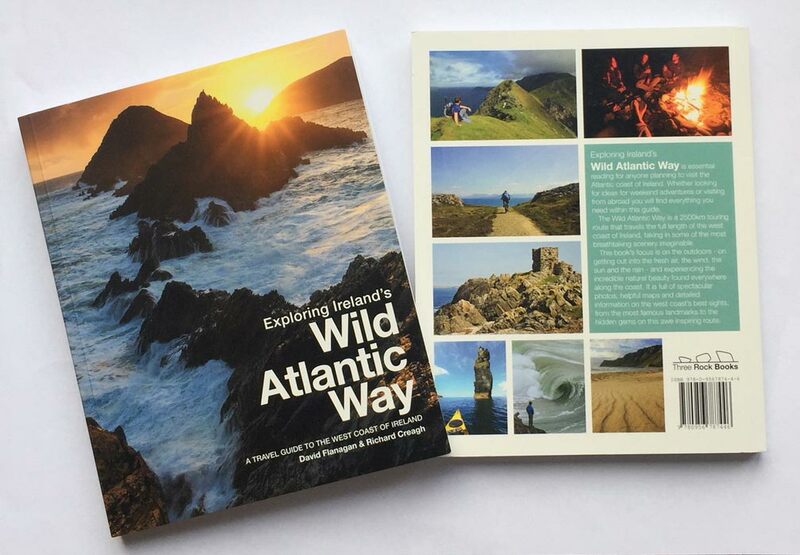 And the winner of our previous giveaway was…..
Congratulations to Julie Golden-Gallagher from Sligo who won a copy of Ireland’s Wild Atlantic Way, A Walking Guide by Helen Fairbairn reviewed in another of our tourism books reviews here.